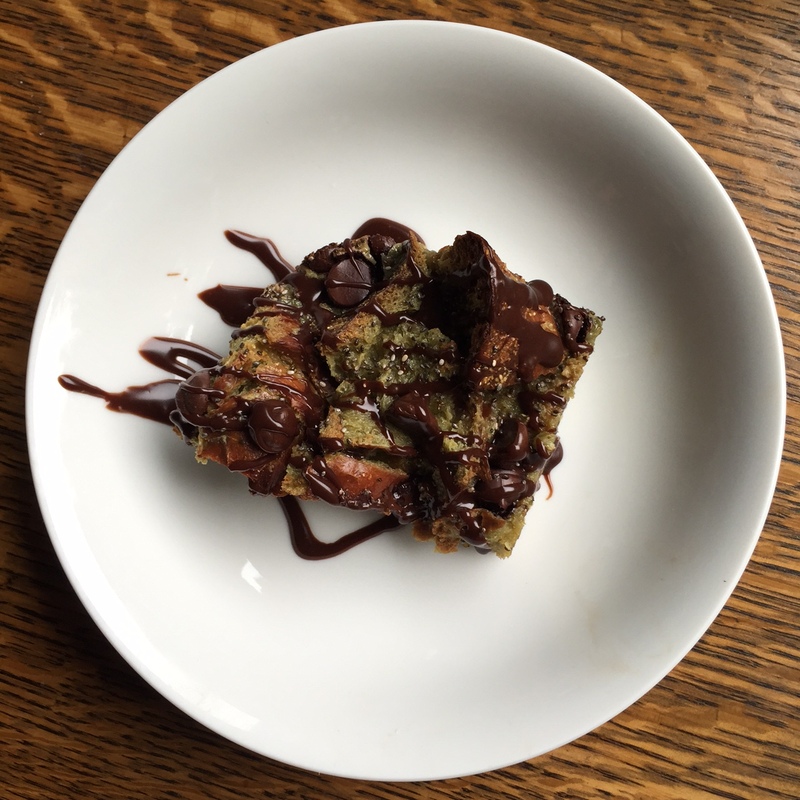 Combining three of my favorite ingredients (aka my holy trinity for healthy desserts) matcha, chia and dark chocolate, this healthyish (emphasis on the -ish) bread pudding is a delicious twist on a traditional dessert. And did I mention that there’s a Nutella drizzle to top it all off? Optional: Heat 1/2 cup of Nutella (or other chocolate hazelnut spread) and combine with 1-2 tablespoons of milk until thin enough to easily drizzle. 1. Heat oven to 375ºF. Place cubed bread onto a baking sheet and toast in the oven for about 10 minutes or until dry and slightly crunchy. 2. In a small glass measuring cup, heat 2 tbsp. of the cream in the microwave for 30 seconds and whisk together with the matcha. Do this until the cream is a milky green in color and no chunks of matcha remain. 3. After the bread is toasted, allow to cool and turn the oven down to 350ºF. Grease a small baking dish (I used an 8 x 11 rectangular glass dish) with unsalted butter. Set aside. 4. In a large mixing bowl, whisk together the matcha cream mixture with the remaining cream, vanilla, sugar and eggs. Dump the cubed bread in and gently fold and press into the custard mixture until almost completely absorbed. 5. Pour the bread and custard into the baking dish and sprinkle the dark chocolate morsels on top. Carefully press the chocolate into the bread and sprinkle the chia seeds on top before putting into the oven for 25-30 minutes (or until the custard is set and the top is lightly browned). 6. Allow to cool for 20 minutes, cut a piece, drizzle some nutella on top and enjoy! 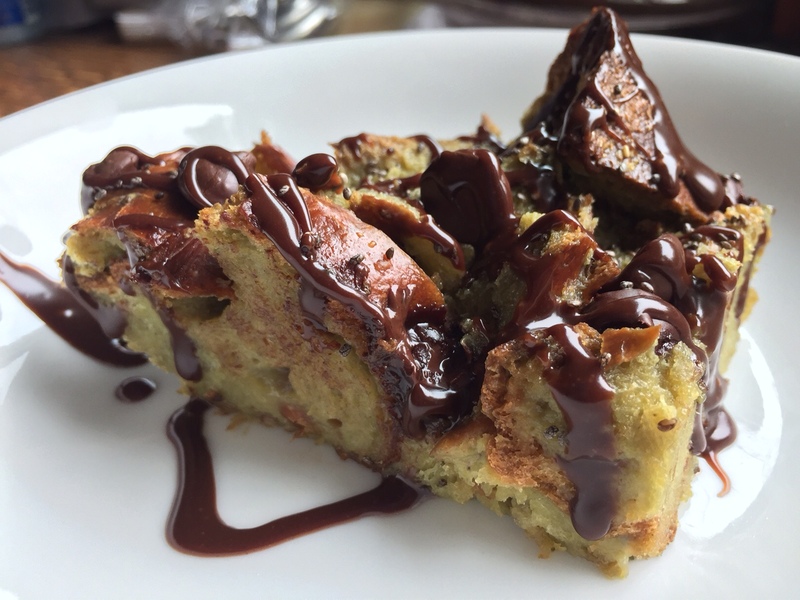 A big help in my creation of this recipe was an article with great tips for making bread puddings both sweet and savory on Marcus Samuelsson’s website. If you try this recipe out, let me know what you think!